I'm an old house person. I like old buildings in general. When I'm driving down the street, I notice the old buildings and think they are cool. When I'm on vacation and there are tours to be taken of old houses, sign me up. And when there is an old building in dire straights, I worry. A few weeks ago, I was told of a small church that had fallen on hard times. The church was built sometime in the 1920s by immigrants to a small MN town. 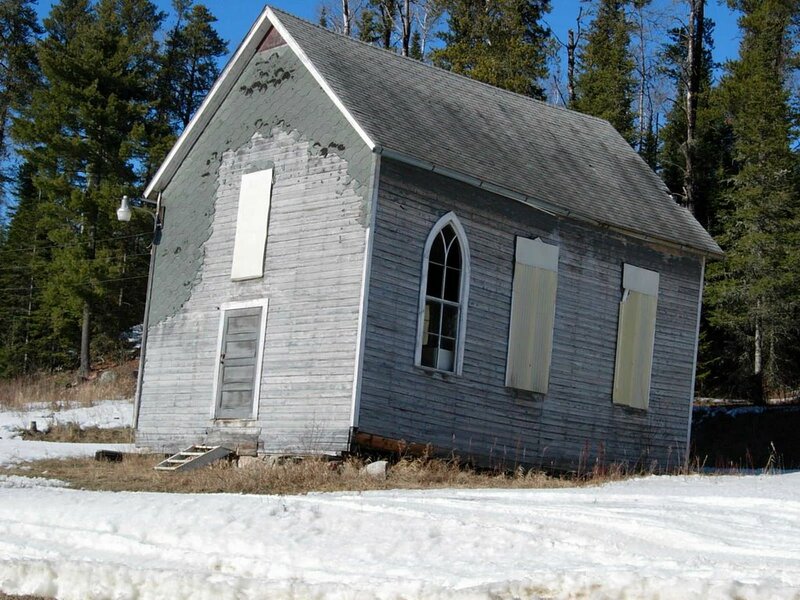 When the congregation outgrew the church (and a town hall), it was left sitting peacefully on the hillside. 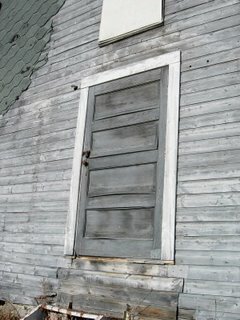 Over time, the wood weathered, the foundation crumbled and the windows were broken. In the hopes of finding the church (and the town hall) a new lease on life, the town held a silent auction. The highest bid would then own the building - and could move it to its new home. At the end of the bidding, the town hall had a new owner. The little church did not. I think this little church is just the cutest thing. 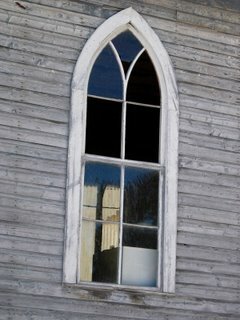 I have images of stained glass windows, a stone foundation and a wooded lot. 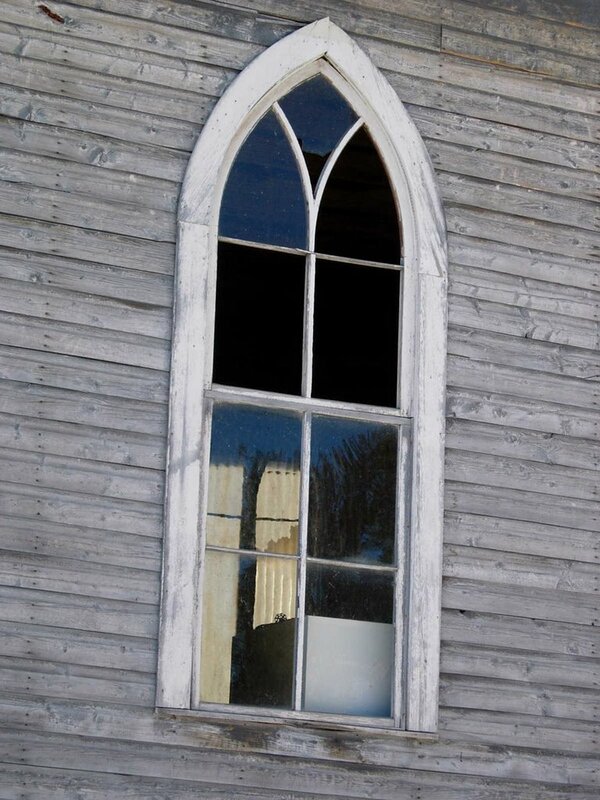 It could be fitted with salvaged pews & old church lighting. When I start talking, everyone here gives me looks indicating they think I am stark raving mad....mixed with just a little fear that I may be serious and could actually pull this off somehow. I tell ya.......if I had the money, I'd do it. I received a postcard in the mail the other day advertising a city sponsored Rain Garden Workshop. The workshops are conducted in a bunch of Minneapolis locations (and one Minnetonka) and times. You register on their website. Even if you don't attend one of their classes, the website is pretty interesting for anyone gardening in the Midwest. Good for you, good for your yard, good for the environment. I rarely write about anything on my blog that is not at least somewhat related to my house and it's restoration and maintenance. Ok, maybe an occasional whine about how much I don't want to restore & maintain that day. But, I assume that you arrive at this blog because, well, it is a house blog and that's what you want to read about. Having said that, yesterday I had the best cupcake that I have eaten in a really long time. I wanted to share this. But, alas it was not restoration or maintenance related. A quandry. So, I decided to add a The Neighborhood section to my blog's sidebar. I'll add and remove sites as they dawn on me or as I tire of them - no post, just a periodically updated list ofmy favorite non-house spots in the 'hood. The cupcake was from the Franklin Street Bakery. There, I got to share afterall. I took a little road trip last weekend. I spent time relaxing, snowshoing and breathing fresh air. This put me into a good zen to go pick up my replated hardware. 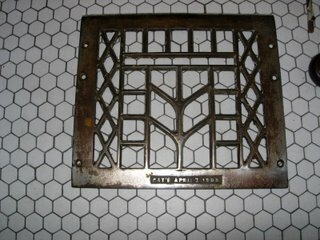 So, yesterday I drove over (again) to the plating company to pick up my loot. Just to refresh your memory. 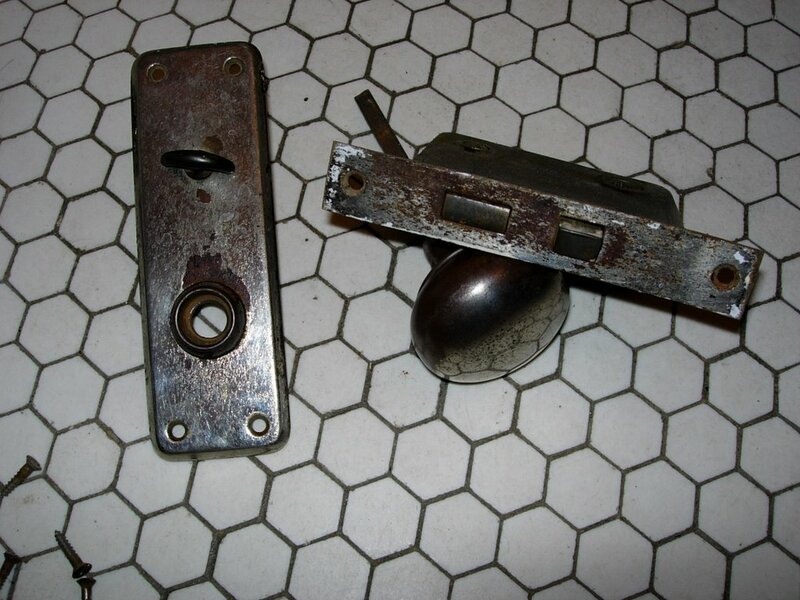 My old bathroom hardware looked like this when I moved into my house. The original nickel was worn off in spots & others were rusted. I brought the hardware in to the plating company. On a whim, I also brought along a heat vent cover that I had stripped of ugly brown paint. 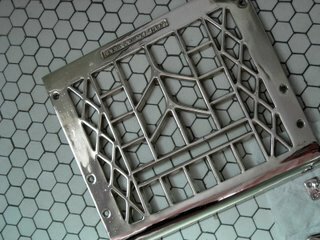 The guy at the plating company told me he would charge me $30 for the hardware and $60 for the vent to replate them in nickel. A bit pricey for the vent, but I figured it would look more like the original (vs. the black paint I had planned on using). I agreed. A week later he called me to tell me they were done. I drove over to pick them up. When I walked into the shop there was a young guy polishing my pieces. They then wrapped them up in newspaper, and I took them home. When I got home and unwrapped them, much to my disappointment, I noticed that were chips along the edges of most of the pieces. The vent cover appeared to be ok. I drove the door hardware pieces back to the shop and he agreed to sandblast them down again and (re)replate them. It kind of ticked me off that the younger guy polishing the pieces didn't say - "wait a sec, we need to redo these" - before I got all the way home. What happened to care of the customer & pride of craftsmanship? They told me it would take a couple of days. I waited for a call. None came. So two weeks later, I drove over to the shop. There sat my hardware, sandblasted but no new finish. I drove home and waited another week. Drove back. Not done yet. Another week. I drove over and the guy pulled out my pieces. They were done, but they were done in a brushed nickel finish. I wanted a shiny nickel finish. They told me a couple of more days to (re)(re)replate. The guy also told me they would give me some type of credit. I waited. No call. So, after two weeks I drove over to the shop again. They were done. I inspected them closely. They were shiny and didn't have chips. Finally. No mention was made of giving me credit for my troubles. And to be honest I just wanted to get out of that place. By this time I felt like some type of pain in the neck customer. The (re)(re)replated hardware looks good, I think. It is a thicker plating then they put on it the first time (when it was chipped). 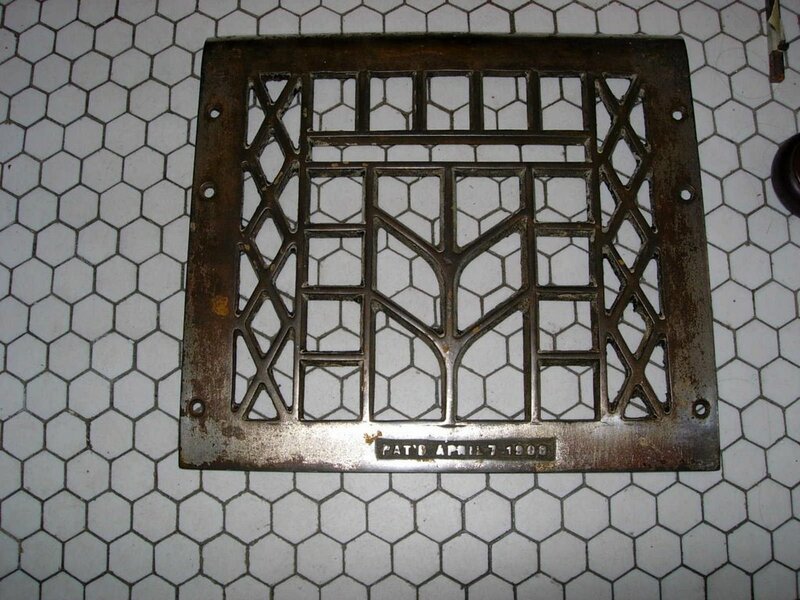 However, when I laid out the pieces to take a photo, I noticed the the vent cover now has spots of rust coming through the too thin area in the vent grill (sigh). I've put a carnauba wax on the metal and hope this will stop it. For $60 it should not be rusting, but after my misadventure I am done with that place. Would I replate again? Absolutely. Would I use that plating company again? No. Yesterday we got pummeled by snow. 11" when it was all said and done. My electricity was down most of the day. This whole situation was a bit cruel because the week before we had actually hit 50 degrees and the tiniest bit of Spring fever was starting to hit. I had even called my concrete guy in the hopes of getting my front step project on his calendar. I'm not sure why, but every year we fall for this. Then comes the state basketball tournaments and we get hit by a "tourny" blizzard. It happens almost every year, and every year we (by this I mean almost every resident of the state of MN) fall for it once again. Good grief, we even have a name for this annual snowstorm and still, it takes us by surprise. So, I dug out my front walkway and my car. It was a wet & heavy snow. The kind that looks so pretty on the branches of trees, but also causes them to snap off. This means you have to go around to all of your plants and shake the snow off their branches. My electricty was still down by mid-afternoon and many of my clients had a snow day. I spent some time painting my upstairs. White paint over a bad yellow & gold sponge paint job. I'll spare you the "as the paint dries" details....except to say, I managed to choose the wrong shade of white. In the end, I will need to put on another coat of a different "shade" of white. More on this later. 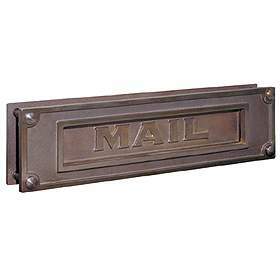 I also got a chance to do a little more research on finding a new mail slot. I've been looking for one on and off for the past couple of years. When they replace my front steps, I will need a new mailbox (my current mailbox is a monstrosity that is attached to the stairway railing). The plan is to put a mail slot in the wall on the left side of my door. Recently, I ran across one that seemed perfect (brass with "mail" stamped on the face), but as I read the specs. discovered it had a flap that swung inward without a spring. This nagged at me. I have a lot of squirrels in my yard and I could see one of them figuring out how that little flap worked and using it as his own little "pet doorway." It's been established that I don't do well with wildlife in my house. So, the search continued. At long last (who would have thought it would be so difficult?) I found two other promising options. Both of these have flaps that lift upward rather than swing inward. What do you think? The one on the left may be a bit Victorian for my house, but I really like it. In my last years of elementary school I became interested in books. I read constantly. Harriet the Spy, The Borrowers, Nancy Drew....those same books little girls have read for decades. One of my favorites was the Betsy-Tacy (and later Tib) series by Maud Hart Lovelace. They were two fictional little girls who became best friends and shared many secrets and adventures. Both of them lived in old Minnesota houses described in historical detail in the books. Flash forward a lot of years (you though I was going to tell you how old I am?!). I was sitting around one lazy afternoon watching tv and happened upon a Hometime episode that caught my attention. Dean, the show's host, and his crew were on site in Mankato, MN at the request of The Betsy-Tacy Society. 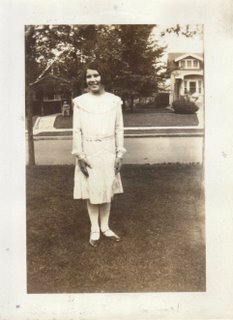 The Society had purchased the actual Betsy and Tacy houses (link to photos) written about in the books and wanted to restore them. 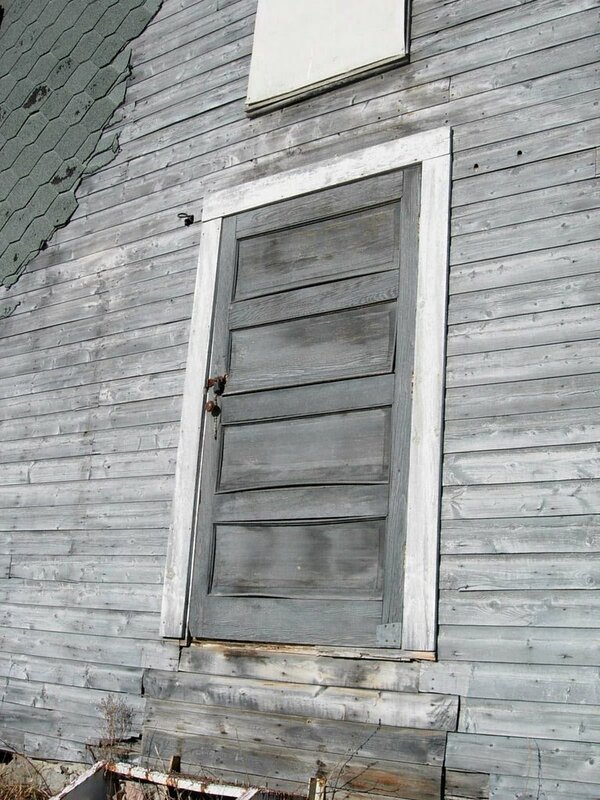 The Hometime episode featured the restoration of the entryway/porch to its original condition, replacing small, ugly replacement windows with nice original sized wood double hungs, and patching areas of the original clapboard that had rotted with new cedar clapboard. It was all done in the spirit of true restoration and was very interesting to watch. According to the Society, their next project is to retore the interiors of the houses based on the descriptions provided in the books. Very cool. 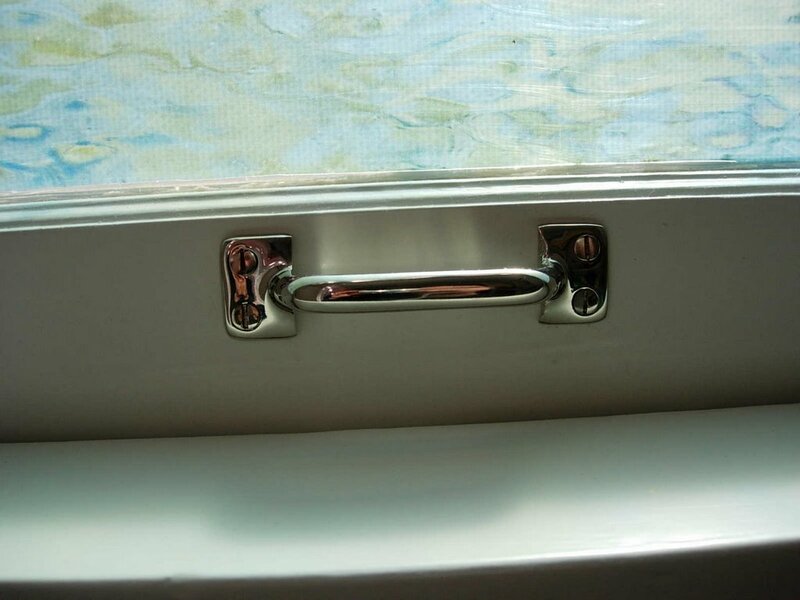 Got a call that the (re)re-plating of my bathroom door hardware was finally done. Drove over to pick it up (this is probably my 5th trip over there). Guy in charge showed me the pieces. They were freaking brushed nickel. I did not want brushed nickel. I asked for shiny nickel. And even with the brushed finish, the backplate had odd smears on it. They are now going to "remove the lacquer" and they supposedly will be ready tomorrow. I am not a happy camper and I have this sinking feeling that they are going to try to "fix" something and I'm going to end up with something that looks "fixed." I held my tongue. I will go back tomorrow and hope for the best. Only an old house owner could get as excited as I am about this. A couple of years ago, my neighbors across the street mentioned they had some old photos of my house. 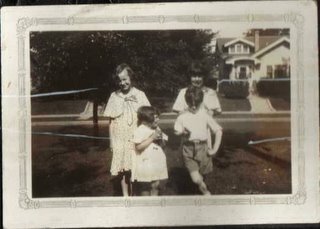 Their house had been in their family since it was built in the early 1900's and some of the family photos ended up with the current home owners. The family had a nice habit of taking photos on their front lawn....with my house in the background. At any rate, I kept forgetting to ask them for a copy of the photos.....until Sunday when I ran into them on the street. 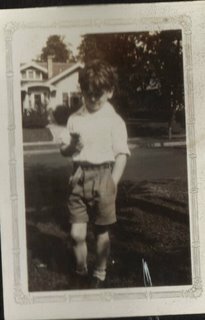 They brought over their family album for me to pull out photos of my house to scan. 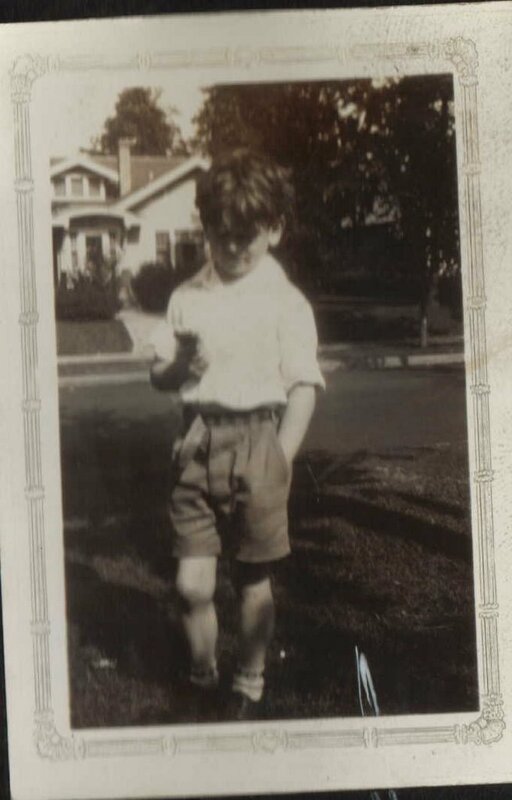 By their guess, the photos date from the 1930's. So, the house was 6-15 yrs old. My house is in the distance, so there isn't great detail. But enough to get enthused about. For example, who knew I had such a big side yard at one time. That the light above my front door was a simple rectangular light. That the ceder tree in my yard that reaches up to my roof, was once a short little bush.....and that there was a nice hedge under my front window. It also looks like the front doorway was painted white. By blowing the photo up, I can also get a vague idea of what the front steps look like. 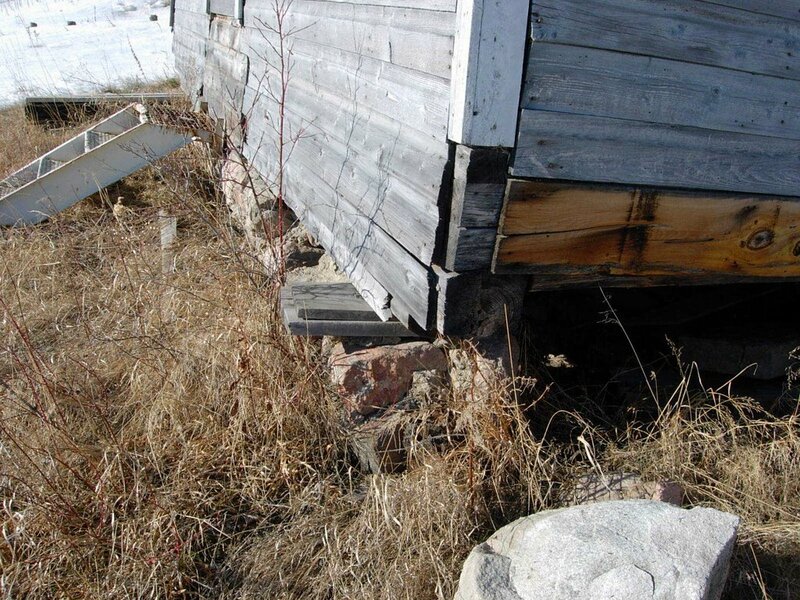 As suspected, there were built in arm rails....and some type of curb that ran down the sides of the stairs. 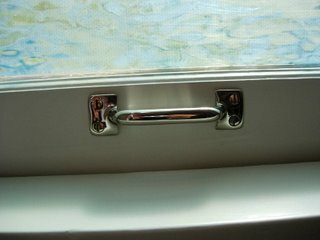 I also can see that the original storm door had a 1/4 wood panel and then an glass/screen insert (replacing the current aluminum storm door is on the "to do" list). Geez, and look at the sunken stairs on the lower half of my lawn. I like those better than the raised stairs I currently have. One thing I wish I could see.....and don't think I can is where the original mailbox was. My other neighbor had also mentioned that at one time the frontstep was enclosed, but from these photos it would seem that was a later addition (that was removed again before I bought the house). Yesterday, my mom & dad called to see if I wanted to go to the Home and Garden Show with them. I've never been to one, so I told them to pick me up on their way downtown. I was totally surprised at the number of people that visited the show. We ended up parking in a ramp a good ways away from the convention center and walking in. There we in the ballpark of 1000 exhibitors - all things house and garden. Even Tim Silva from This Old House was there signing autographs for the faithful. It was fun wandering up and down the aisles seeing what was new and trendy in house building, remodeling, redecorating and repair. My dad is a structural engineer and was interested in the metal roofing and the log home builders. Turns out the log supplier for my parents' cabin was at the show, so we looked through his books to see if he had photos of my parent's cabin on display. My mom likes to watch the product demonstrations and was interested in what the concrete stamping companies could do, which I have to admit is pretty impressive. I also ended up running across a few booths of interest. The first one caught me by surprise. I had been planning a road trip to the Shell Lake Furniture showroom to order a side table for my livingroom. I visited their showroom a couple of years ago and bought some picture frames and a small step stool.....but my real purpose was to pick up information on their furniture line. Now I am ready to order, so it was good to be able to talk to the company rep. and ask her a few questions I had. They had some custom kitchen cabinets on display that were spectacular. Not too long after, I ran across the booth from Prairie Woodworking. I've been meaning to stop into their shop on East Lake Street for a while. They advertise custom made radiator covers that look very nice. I was interested in seeing if they do other woodworking. Turns out the booth was manned by the "company owner, woodworker, floor sweep", Tim Granlund. Good news is that he knows the "bungalow" style and does do carpentry in things non-radiator. He is now on my short list for the window seat and colonnade projects I have planned for my upstairs. I like working with local companies where the owner is actually doing the work. The North Prairie Tile Works has also been on my radar for a while and I was happy to see their booth at the show. 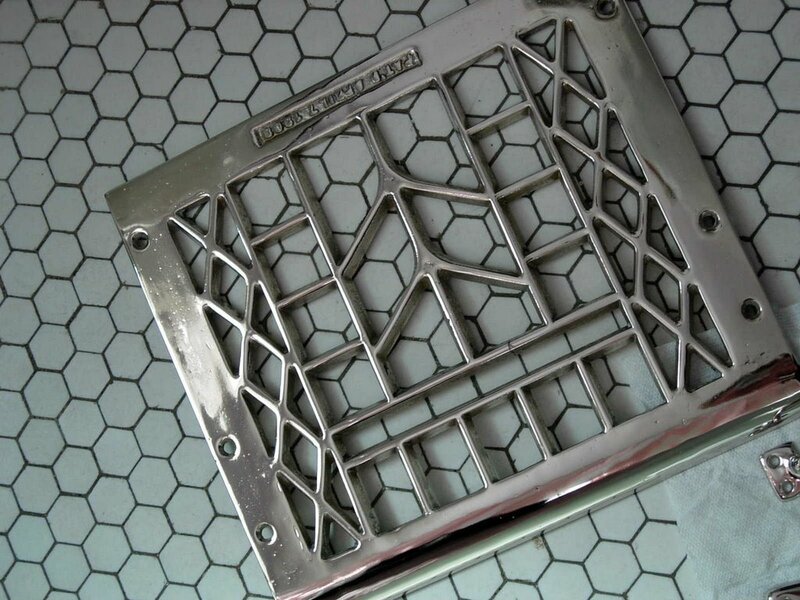 I have it in the back of my mind that I would like a tile backsplash behind my stove (is that what they are called?)...eventually. It would be nice to be able to get those tiles from a local company. The previous owner of my house did something funky when he painted (gasp!) the stucco of my house. I chatted briefly with the Donnelly brother at the booth about my "situation" and took a card from Donnelly Stucco. Having soemone come out and tell me what I can do about the stucco is on my "to do list." Cold Spring Granite had some pretty impressive pieces of granite on display (and also gave me a few flashbacks to my college days as I went to school not far away from their pits - and the CS bakery). With the exception of the $3.75 I had to pay for a glass of Coke, all-in-all it was a very fun afternoon! I've decided I may need to get a part time job at one of those booths. Lesson learned. Optimism has no place in blogging. A couple of weeks ago, I gushed about Rejuvenation. 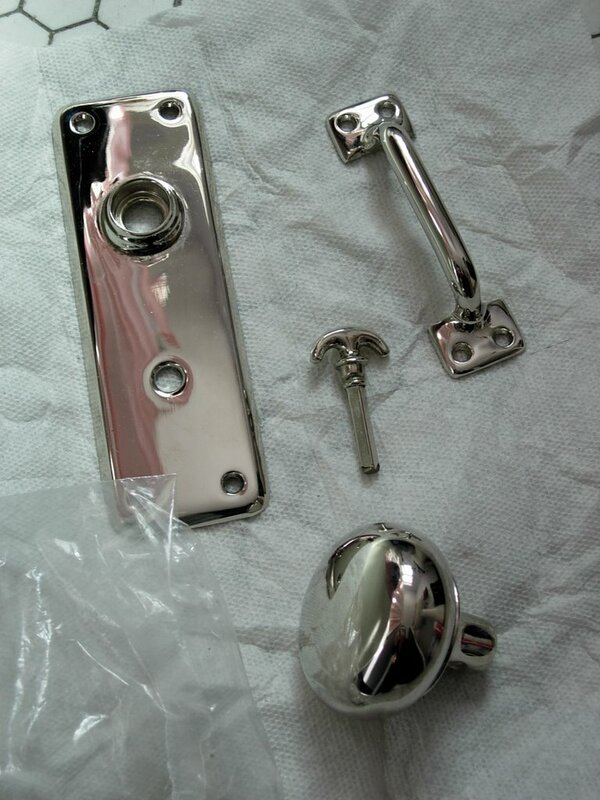 I had called them about some hardware that they carried that matched a vintage set of bathroom fixtures I had. I gave them the product info. and they were going to send me the hardware. I was terribly excited. The hardware arrived. It was the wrong stuff. I am able to tell them the product they sell that uses the hardware I need, so I'm not sure why it has become so difficult. Anyway, I called back...thought maybe I could email them a picture of what I need.....haven't heard back from them. That was over a week ago. Sigh. 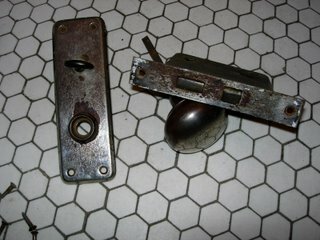 Then I posted with a promise to show photos of my newly replated bathroom hardware. Well, three weeks ago I picked up my hardware stash from the plating company. It was all shiny and once again I was terribly excited. When I got it home and took a close look at it....I noticed the majority of the pieces had spots where the new plating was missing or chipped edges (although, in fairness my register vent turned out quite nice). So, back to the plating co. they went. The guy there told me they would be done Tues......Tues. when I went, he told me next Wed......today, still no call telling me they are done.....sometime next week, I hope. Sigh. My new rule is: Post about something only after it has arrived and sucessfully installed.